California voters passed Proposition 64 on the faithful election day, November 8, 2016 , which legalized the recreational use of marijuana by adults. Some of the legislation is straightforward, but there are some quirks and items that are, shall we say, counterintuitive. For example, Californian's can't legally buy recreational weed anywhere until 2018, but they may grow it or share it. 1 Retail of recreational marijuana will go into effect until January 2018 at the earliest. 2 Effective immediately, adults 21+ can legally possess, transport, and grow marijuana for recreational purposes. 3 Effective immediately, every adult Californian can possess an ounce of cannabis, 8 grams of cannabis concentrate and / or six plants or less in their home. 4 Law enforcement can no longer use the smell of marijuana or the presence of marijuana paraphernalia as a legitimate reason to detain or search a person or their property. 5 Marijuana is a legal commodity, in the same bracket as alcoholic beverages, like beer and wine. 6 Taxes revenue on Recreational Marijuana won't come in until Recreational Dispensaries open in 2018. Tax revenue is expected to be around a billion dollars per year based on an extrapolation from Colorado population and marijuana revenue data. 7 Most of the prop 64 document deals with details about industry. licensing and taxation. “The whole process will take time,” - National Organization for the Reform of Marijuana Laws (NORML). 8 Smoking marijuana in public is illegal, thought special smoking areas are being considered. 9 Driving while being impaired - stoned is illegal. 10 Recreational marijuana shops cannot be within 600 feet of daycare centers, schools and youth centers. 11 Businesses that sell alcohol or tobacco cannot sell weed, or vice versa. 12 Marijuana edibles must be labeled like any other food product, specifying safe portion sizes and warnings about potential allergic reactions. 13 Recreational marijuana customers need to show picture ID to verify they are over age 21. 14 Local communities can still ban commercial marijuana transactions by ordinance and regulate marijuana locations through local zoning laws. 15 Local communities cannot ban a resident from growing up to six plants at home, nor can they ban the use (at home), possess, and transport of marijuana. 16 Criminal records can be changed to reflect the new law, for example, if a person was busted for six or less plants, this is now legal and the previous conviction can be erased from the records. If a marijuana related offense is now a misdemeanor, then those charges can be changed to a misdemeanor. 17 One of the major provisions of the law allows those with prior marijuana convictions to petition the courts to revisit cases that the new law legalizes. 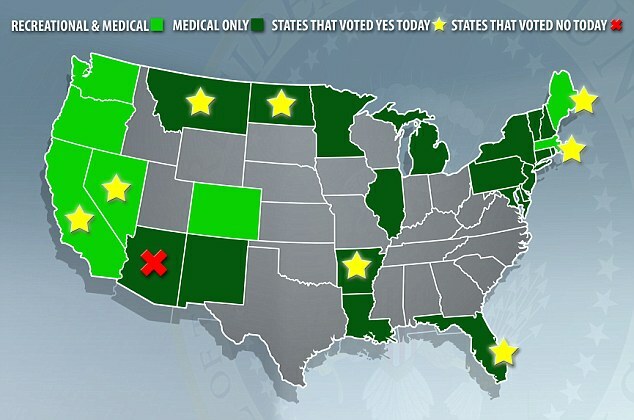 18 Recreational marijuana users can't buy from a medical marijuana dispensary until 2018. 19 Recreational marijuana users can't legally buy recreational marijuana in Oregon or another state and import it into California, as this violates Federal law and interstate commerce. 20 For one year or so, recreational users must grow their own marijuana to use it legally. 21 Recreational users that smoke for anxiety, depression, insomnia or another symptom can apply to get a medical marijuana license. 22 Sales of medical marijuana to patients with valid medical cannabis ID cards exempts them from paying any existing state sales and use tax. So having Cannabis Medical ID will likely save hundreds of dollars per year and patients will have access to the better lab tested strains out there. To get a legal recommendation and ID in minutes by a licensed medical doctor online, click on this link. 23 Recreational users will have rely — if they don’t want to break the law — on using pot from their plants at home or by getting it from medical marijuana users. But it’s against the law for a medical marijuana user to sell pot to somebody else; they can only give it away for free. 24 Industrial Hemp is regulated by Department of Food and Agriculture. Look for Hemp to make a comeback a major agricultural commodity!!. 25 Medical marijuana patients personal information that is disclosed to government health departments is privacy protected under the Confidentiality of Medical Information Act. 26 Medical marijuana patients cannot lose their custodial or parental rights solely based on their status as MMJ patient. 27 Medical marijuana patients must obtain a new recommendation by a licensed doctor to meet the new requirements in the Medical Cannabis Regulation and Safety Act. 28 The California Bureau of Medical Cannabis Regulation is now called the Bureau of Marijuana Control. 29 Criminal penalties for non-serious marijuana-related offenses, such as possession of more than 1 ounce of marijuana, are reduced to misdemeanors. 420EVALUATIONSONLINE Notes: 100% online, permit emailed same day, medical marijuana 420 recommendations, evaluations, permits for cultivation and renewals. From 7am to 11pm every day, an operator is standing by to process your application. Under the Telehealth program, The Medical Board of California approves of patients and doctors to get together online - to save everyone time and money - to process medical files and perform medical recommendations, including the treatment of conditions and symptoms with Cannabis Based Medicines.